Every new release from DNN is bigger and better than its predecessor. Whilst we firmly subscribe to the maxim ‘if it ain’t broke, don’t fix it’, we do recommend having your DNN installation upgraded at least once every 12 – 18 months. This ensures you will benefit from many of the behind-the-scenes improvements that are made e.g. We want you to be able to take advantage of DNN new features and functionality, and our Upgrade services can help make that happen. If you have questions like how can I upgrade dnn..., how to upgrade dnn, then we can help you. We perform upgrades differently than many vendors, especially hosting companies. Each site that we upgrade is a specific project; we do not simply "upgrade and forget". Before we upgrade we ensure that full backups are taken of your site and database, this ensures that we are able to recover if the upgrade would not be successful. After a successful upgrade from the DNN installers perspective we fully validate the operation of your site to ensure that no hidden surprises are uncovered days later when it isn't possible to recover. So when we complete a "Successful Upgrade" you can be assured that it is truly successful. Using this process we can stand behind our upgrade and ensure that you are safe, stable, and ready for the future! As we look at complexity and risk of upgrade revision upgrades, sometimes also called "Point Release" upgrades, are the least risky. In most cases these are DNN releases that have been designed to stabilize or otherwise secure the platform within this specific Major/Minor version. Typically these upgrades are seamless and rarely are they impacted by third-party modules or other configuration elements. Changes in hosting environments or other systematic changes do not occur in these releases, making them that much easier. We can perform these upgrades for you to ensure that you stay on the most current, most stable, and most secure version of DNN possible. Even with these less risky releases we still follow our detailed process to ensure that your site is fully operational after upgrade. The average time needed for a revision upgrade is 1-3 hours, depending on the size of site, and overall configuration. The slightly more risky upgrade is the Minor version upgrade. Often times these releases include new features or functionality, and occasionally can dictate platform changes or other system requirements changes. As such, it is possible that these upgrades will require further changes to your hosting environment or other system upgrades. Third-Party modules can also require upgrades to support new functionality or changed functionality within the minor versions. Given the more complex nature of these minor version upgrades part of the process to upgrade will involve a detailed audit of all third-party modules and an identification of any needed upgrades of these extensions. Typically these upgrades are billed in two parts, an investigative portion to ensure that the true scope of upgrade is known and an actual upgrade portion. Minor version upgrades can range between 2 to 10 hours depending on specific version numbers as well as the inclusion of third party modules (Additional costs may apply for upgraded licenses for third party modules). 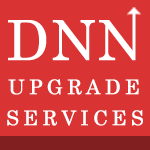 The most difficult of DNN upgrades are major version upgrades. Over the recent years these upgrades have often dictated numerous changes before a successful upgrade can be completed. This includes hosting environment upgrades, skin updates, and third party module upgrades. If we look at the changes between 5.x and 9.x of DNN we see that on average 60% of sites that have been upgraded will require changes to their skin or other modifications to properly work with the new methods of operation. Given the nature of these upgrades a more detailed upgrade process is often needed. To mitigate risks and to reduce costs a copy of the current site will be obtained and a local copy will be restored for us to attempt an upgrade. By doing this problem areas can be identified and a proper plan of action can be created to ensure that the site is upgraded seamlessly. Major version upgrades can range between 5 to 15 hours depending on specific version numbers as well as the inclusion of third party modules (Additional costs may apply for upgraded licenses for third party modules).